American Cookery magazine, June-July 1920. 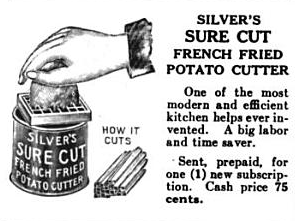 This was a premium offered to subscribers of American Cookery in 1920. “We have a new hired girl at our place,” announced Mrs. Jones, and I want to tell you she is none of those new fangled efficiency teachers, either; why she has them all beat to pieces, when it comes to labor saving over the cook stove. She does things in half the time it takes me to do it. When I make a layer cake, I always cut paper to fit the pans, but Sally don’t, she just greases the tins well, then tosses a handful of flour into them and turns it till the whole pan is dusted, then empties the surplus out. “Her cakes never stick either. “She had me get her a cheap paint brush for greasing pans, and to make sure the bristles wouldn t fall out into things, she dropped some shellac varnish on the bristles where they are set into the wood. “Now take her way of making cookies. She rolls the dough out in one sheet and bakes it in one large dripping pan. Then just as soon as she takes it from the oven she scores it into squares or triangles and the cookies break off neatly when cool. “Yes, and I thought I knew all about making pies, but to see her go about it makes me feel as though I didn’t know anything; she always measures everything used, and then she mixes the shortening in with a fork.